Big thanks to Nathan Sports for providing the prizes for today’s post. I’m excited to team up with Nathan Sports to bring you another fun giveaway! 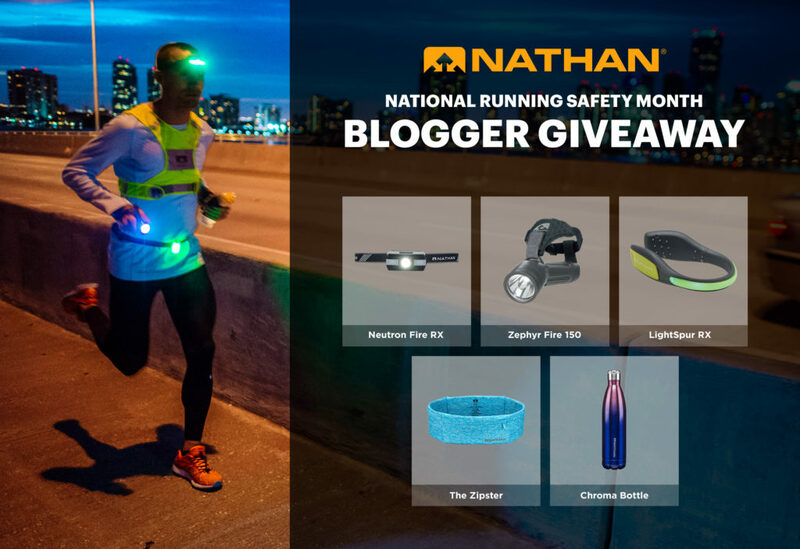 November is National Running Safety Month, and we’re celebrating by giving away a big bundle of running gear to help keep you safe out there. This waist pack has two zippered, weather-resistant pockets (four pockets total). The super-soft stretch belt fits comfortably around your waist and is big enough to hold an iPhone 7 Plus! It’s easy to enter – just follow the instructions on the Rafflecopter below. Good luck! I have to have a head lamp when I run at night. I have a head lamp and wear reflective bands and clothing. I always carry my phone! This is a great package to help promote runner safety! Cheers to you and Natham Sports! Would it be weird if I said my dogs are my running safety must-have? They alert me to anything new in the area that shouldn’t be there. If my dogs are on guard, then I should be paying attention. I bring my phone and make sure my clothes are reflective just in case it gets darker during my evening runs. I always wear my road ID. And my headlamp on darker runs. I always bring my phone and my Road ID tag (on my shoe). And if it’s dark out, my headlamp for sure. I always run with my phone. When doing longer training runs, my husband uses it to track my progress (and bring me water!). This would be a great gift for some of my runner friends!